One of the first projects that Three Parishes Big Local developed in early 2015 was to bring a Credit Union to the local area with the aim of ensuring that all local people are able to easily access the types of services that Credit Unions provide. “FAIRshare Credit Union is a friendly, not-for-profit, financial co-operative or ‘community bank’, owned by and run for the benefit of its members, providing a secure home for savings, and low cost affordable loans to members. FAIRshare is pleased to be working with the Three Parishes Big Local Partnership to bring its services to the residents of Weston Rhyn, St Martins & Gobowen. Everyone who lives or works in Shropshire can join FAIRshare. No credit checks are carried out before opening a savings account – previous County Court Judgements (CCJs), bankruptcy, insolvency or a poor credit rating – do not prevent someone from joining, and no charges are made for the services provided. 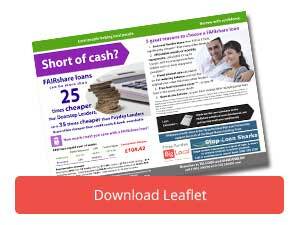 FAIRshare asks members to save as little or as much as they can afford, from just £1/week or £5/month. FAIRshare members have the option to access affordable low cost loans from £50 to £7,500 in value, with repayments over anything from a few weeks up to five years. Interest charges from only 0.83% (10.47% APR) per month are calculated on the reducing balance – not the original loan value – and the amount borrowed is based on the member’s income and expenditure and their ability to repay the loan. There are no arrangement fees and no penalties for early repayment. Credit Union interest rates are capped by their regulators at 3% per month, or 42.6% APR. A Credit Union is for all sorts of people, and NOT as commonly misunderstood, only for those on benefits – far from it. In fact many of the most successful credit unions in the UK are employee based organisations - Plane Saver CU (BA & airline industry), No. 1 CopperPot CU (police), National Fire Savers CU (fire & rescue service), Penny Post & 1st Class CU (royal mail employees). Worldwide, there are more than 57,000 credit unions in 105 countries serving 217 million people. In the UK there are around 500 credit unions, serving 1.23 million members, and with assets totalling £1.35 billion. Typically membership of FAIRshare falls between 2 categories – Ethical Savers who may occasionally borrow but like the credit union ethos, and on the other hand, those who are financially excluded who save a small amount to gain access to low cost loans. Regular savings create a “pool of money” which can be loaned to members. The money stays within the local community and benefits others in Shropshire. FAIRshare Credit Union is authorised by the Financial Conduct Authority & regulated by the Financial Conduct Authority & the Prudential Regulation Authority. Members’ savings are protected by the Financial Services Compensation Scheme, currently to the value of £75,000.